Photo by Eric Slatkin. This recipe was developed for and first appeared on ASSEMBLY LINE. Like many, I crave green fresh things at the start of the year. Even in LA it's dreary and cold, and fresh vegetables and leafy greens are very welcome after all of the rich food eaten over the holidays. There are some food trends that are classics. I don't think I'll ever get tired of avocado toast. We're lucky to have so many good avocados in California year round. While I'm often homesick for the Pacific Northwest, avocados and other incredible produce are the things I love most about living here. Simple avocado on toast is perfect, but this is a gussied up version that takes little extra effort. Sometimes I like to start the day with a little extra time put into breakfast. You don't really need a recipe, but here's one just in case. 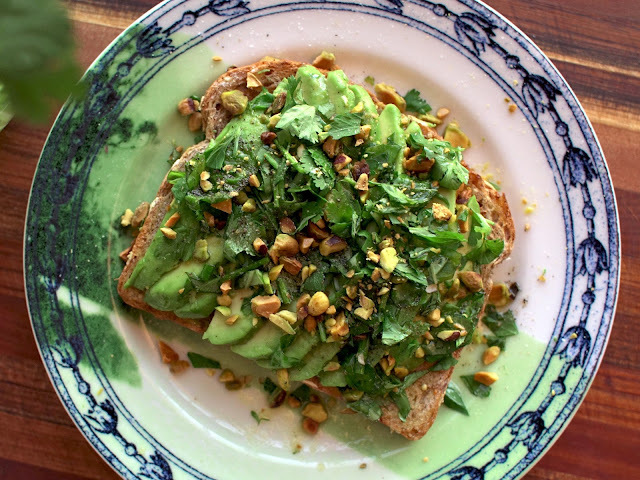 The idea is to add some fresh herbs, some protein in the form of pistachios, some spice with a little bit of thinly sliced jalapeno (optional), and a not of acid with lime zest and juice to this classic toast. There are endless variations and possibilities but I love the combo of creamy avocado paired with herbs, citrus, and nuts. Happy new year! Start by toasting your bread slices. While the bread is toasting, prepare the other ingredients. Halve your avocado, and slice the avocado halves thin. Slice half a jalapeno pepper very thin. On a cutting board, pile the basil, chives, parsley and cilantro together. Roughly chop all of the herbs. Roughly chop the pistachios. Once your bread is toasted, top each slice with half of the avocado. Top the avocado with a few slices of jalapeno, if using. Top the jalapeno with your herb mixture. Top the herbs with chopped pistachios. Grate some fresh lime zest over each slice of toast. Squeeze lime juice over the toast. Drizzle the olive oil over each slice. Finally, garnish the toast with salt and pepper, to taste.